Select the correct choice from the bottom 6 options to fill the final box above the horizontal line. 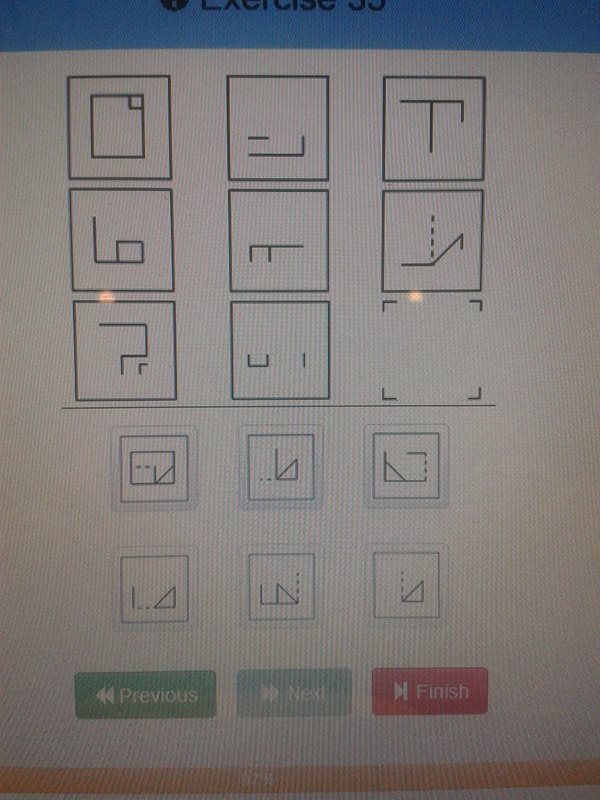 I stumbled upon this seemingly difficult question while doing a Mensa practice test. I have since been trying to figure it out but I can't. I am calling it seemingly difficult, because these questions always appear to be difficult, until you come up or are provided with, their simple and elegant answer. I hope someone can help me! In each column, flip the top image over the horizontal axis. Overlay the second image; where both images have lines, erase the line. You end up with the third image. It is actually difficult. This is one of hardest, at least for me. Glorfindel answered it for me too, and he is right when you listen to what he said. I think it’s the top middle one. On the question the top rows are the completed picture.The bottom and middle rows are combined to make the top picture. The dotted lines means that part will be filled in by the other picture. When you combine the pictures you also get rid of all the parts that they both have in common. Not the answer you're looking for? Browse other questions tagged pattern progressive-matrix or ask your own question.